Process USPS: Allows you to disable processing of USPS orders altogether. Dazzle layout file that will be used when printing labels. Dazzle input file: This is the XML file generated by our application and consumed by Endicia Dazzle. Dazzle output file: This is the XML information file generated by Endicia Dazzle after processing the input file and printing the labels. You can use the output file to integrate Dazzle and our application with a third-part software application. Shipping date: This is the shipping date printed on the labels. API User ID: This is the user ID used to connect to the USPS API server. Our application uses the USPS API to do automatic correction of misspelt or incomplete shipping addresses. Envelope max. weight: This is the combined total weight of the items that a single envelope can hold. Medium box max. weight: This is the combined total weight of the items that a medium-sized box can hold. Large box max. weight: This is the combined total weight of the items that a large box can hold. Custom box max. weight: This is the combined total weight of the items that a custom box can hold. Process UPS: Allows you to disable processing of UPS orders altogether. 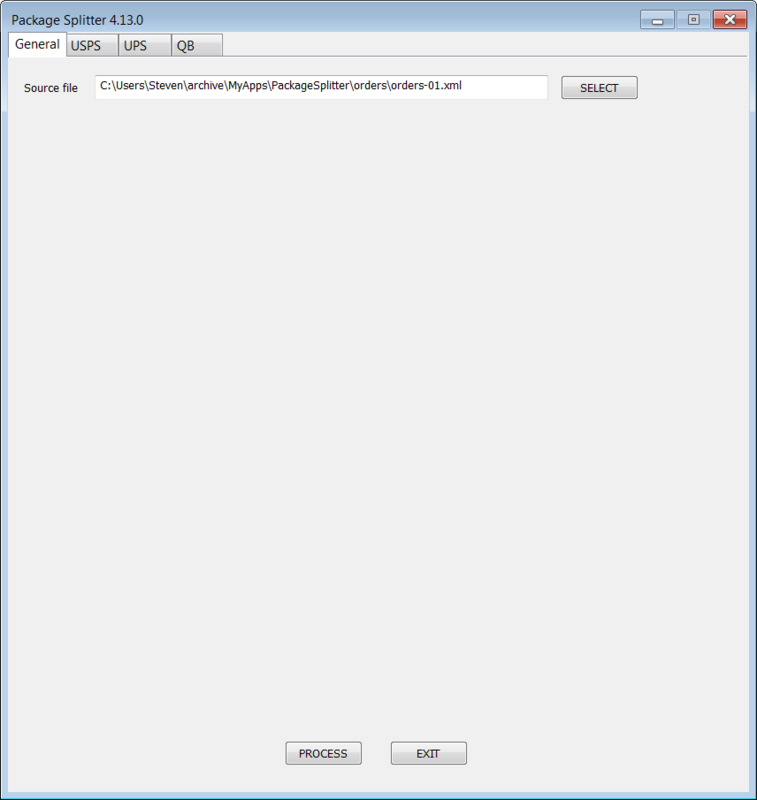 Output file: The XML output file generated by our application. This output file is in a format suitable for auto-imporing by UPS WorldShip. API User ID: The user ID used to connect to the UPS API server. API Access Key: The access key used to connect to the UPS API server. API Password: The password used to connect to the UPS API server. Shipper number: The shipper number used when calculating the optimal shipping rates. Shipper country code: The 2-letter country code of the shipper location used when calculating the optimal shipping rates. Shipper state code: The 2-letter state code of the shipper location used when calculating the optimal shipping rates. Shipper ZIP code: The ZIP code of the shipper location used when calculating the optimal shipping rates. Shipper residential: Checkbox used to specify whether the shipper is located in a residential ares. Used when calculating the optimal shipping rates. Finalize command: After UPS orders have been processed and the UPS WorldShip auto-import file has been generated, it is possible to run an external program in order to do some post-processing, e.g. to activate UPS WorldShip. Non-splittable items: When calculating the optimal UPS box fitting, it is possible to split some items in two pieces in order to achieve better shipping prices. This box contains the list of item names that cannot be split in two pieces. Product name to UPS label map: When printing the list of shipping items on the UPS labels, it is possible to replace the actual product names with shorter product codes. This field allows you to map the product names to these short codes. Export to QB: Allows you to disable exporting to QuickBooks altogether. Company file: The company file to which sales receipts will be exported. Customer name: The common QuickBooks customer name which the sales receipts will be assigned to. 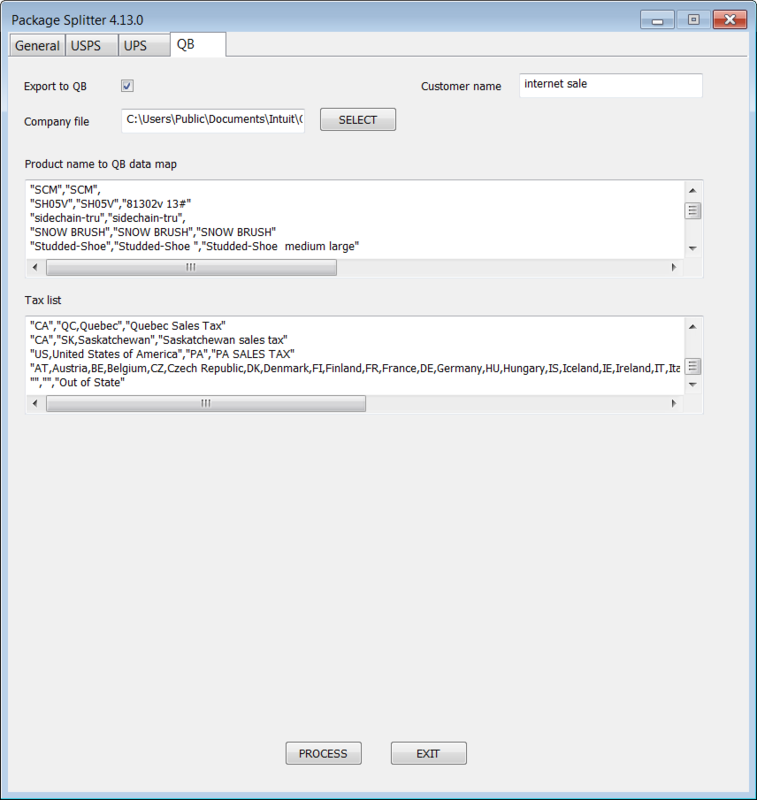 Product name to QB data map: A mapping between the product names in the order file and the product names and descriptions in QuickBooks sales receipts. Tax list: A mapping between the country and state of the shipping address and the QuickBooks tax name. The General settings tab allows you to specify the source XML file from which orders will be imported. The source file must be in ShopSite export format. All imported orders have their shipping addresses automatically checked for validity. Our software is able to correct misspelt and incomplete addresses.